I am so honored and grateful that you have arrived! Stretching Canvas is a space where you have the opportunity to GO BEYOND! Stretch beyond BODY-MIND-SOUL with HANDS-HEAD-HEART. Stretching beyond the canvas of the body, mind and spirit in YOGA, and stretching beyond the body, mind and spirit while PAINTING. 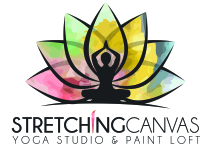 Stretching Canvas was born out of the two things that I LOVE doing most: yoga & painting. It is here that I am fully present in the moment. My intention is to create a space of present moments where you can feel safe, supported and nurtured while you stretch beyond ...wherever your beyond may be. This is a world of unlimited possibilities! As we gently stretch beyond each part of ourselves, we embrace the journey of our soul-saying 'yes' to all unlimited possibilites & the miracles of each and every moment embracing the richness and fullness of life in all its bountiful abundance.